Most of us have been instructed from an early age to keep our hands and our mouths away from fruiting fungi. 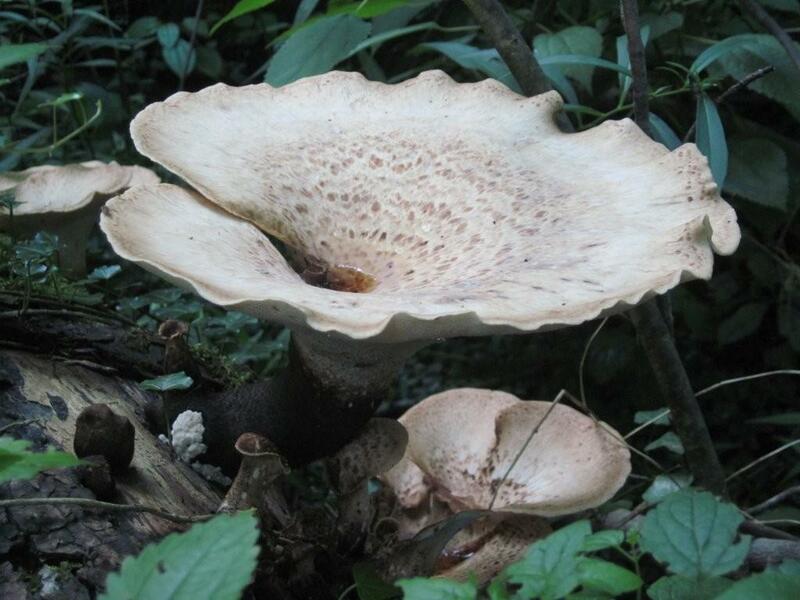 We may be happy to nibble on a bit of wild sorrel, or taste the pungent acidity of a dandelion, but the minute we are faced with a large, beautiful mushroom conjured up from the depths of the forest floor, the words “Touch Not!” echo in our brains, and our eyes dismiss the apparition as a malignant one – certainly wicked, probably deadly. While many of us as gardeners are quite comfortable with distinguishing between poisonous plants in our gardens; nay – even choosing to grow some of the most deadly such as Digitalis, Aconite or Yew, we would not begin to entertain the thought of allowing a magnificent “toadstool” to fruit and flourish in our mulch pile, even if we were told with 100% certainty by a qualified mycologist that the offending fungus was harmless. Meanwhile, in rural and semi-rural areas all over Eastern Europe and Asia, the art of fungi foraging is passed down from generation to generation and wild mushrooms are collected to support and supplement one’s diet. Mushroom patches, where specific varieties have fruited for years, are prized and kept secret from other hunters. To these mycophillic societies, our relative distaste for mushrooming in North America is a fungi hunter’s dream come true – scads of ‘shrooms and hardly anybody ‘shrooming. I have been fascinated by wild and cultivated mushrooms for years, happy to fight my way through brambles and briar when I have glimpsed the unmistakable hue of Chicken of The Woods (Laetiporus sulphurus), or excited to photograph a dinner-plate sized Dryad’s Saddle (Polyporus squamosus), appearing out of a downed maple like something out of Grimm’s Fairy Tales. 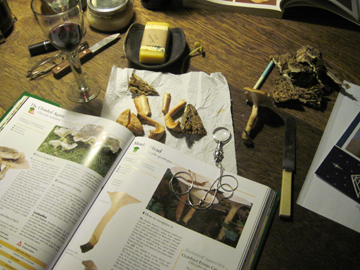 My love affair with mushrooming started years ago at a friend’s cottage nestled into the bracken-covered hillsides of Wales. Mushrooming is a fun pastime for locals there, and dried specimens from previous hunting expeditions were prepared for dinner, eliciting lively discussions late into the night. However, my instinctive excitement for the hunt was tempered with caution, and on another visit a few years later, I well remember interrogating a local poet and avid mycophagist, who had generously shared a recent cache of delicious, nutty Saffron Milk Caps to enliven our pasta dinner. It was that last bit that stuck with me – the idea that certain mushrooms grew in certain places, and not in others. Until that point, it seemed as if the forest floors and the farmers’ fields were littered with mushrooms growing without rhyme or reason. 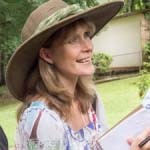 This fall has been a tremendous year for mushrooming, due to the heavy rains combined with warm weather, but as with all good mushrooming years, there is a corresponding uptick in the amount of poisonings. One must never be too cavalier in this pursuit. I have sautéed beautiful, tasty puffballs (Calvatia gigantea) in parsley and butter whilst giving a wide berth to gorgeously wicked Green-gilled Parasols (Chlorophyllum molybdites). Thick slices of Chicken of The Woods currently sit on a shelf of my fridge, wrapped in a paper towel waiting for the sacrificial risotto pan; but a fabulous Amanita rubescens that my daughter proudly found in the woods last Friday was identified, photographed and summarily dismissed. Though technically edible, this beauty shares one too many characteristics with its Amanita cousins, The Death Cap and The Destroying Angel (A. phalloides & virosa respectively), and taking a bite is my version of inviting the Grim Reaper around for a cocktail and a flirt. 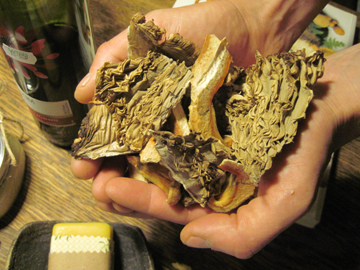 One needn’t be in the culinary game to be interested by fungus – especially this year. Fairy tale scenes are coming alive in forests and meadows near you, giving sport to the photographer and naturalist alike. However, should you find yourself aching to forage for fun, I highly recommend the book Chanterelle Dreams, Amanita Nightmares by Greg A. Marley, where the author discusses cultural attitudes towards mushrooms, and outlines ‘The Foolproof Four’ – Chanterelles, Puffballs, Shaggy Manes, and Chicken of The Woods. Whether you choose to add to your photo album or to your stew pot, I encourage you to open your eyes to this diverse and mysterious world. Just take it easy – I’ve got a Chanterelle patch I’m not too keen on sharing, and it’s never a good idea to come between a girl and her ‘shrooms.